G is for Gamesmanship. Whether or not you are ware of it, at every level of golf in Thailand and especially with Thai golfers, there is gamesmanship going on. Here are some tips if you trying to win a $1 Nassau or your golf club championship which you should at least be aware of!. On the first tee take charge. Shake hands first, introduce yourself first, and ask them about any local rules (such as drop zones, red aunt mounds, lateral hazards, etc. ), what etiquette you will observe, (perhaps you’ll play hit when ready), and tell them what ball you are using (Titleist Pro V1 users should also say what number ball). This shows your opponent you’re confident who the boss is even before a ball has been hit. If you crush a drive and know your partner isn’t going to get it past you, make a quiet comment after you hit your shot and mention that you toed it, but be sure not insult your opponent. I recently played a round at Bangkok Golf Club for the first leg of match play of my golf society. My opponent was playing badly. However, each time I hit a good shot, my opponent didn’t just say good shot (as one should), he went on sarcastically saying things like “your handicap is too high”, “what magic”, “look at this guy, he’s all class”. Before the first hole was over I knew who was going to win. In fact, my opponent giving all the compliments was perhaps the one who knew the best who was going to win, and it wasn’t him. Give credit when credit’s due, but making your opponent feel invincible isn’t the way to go. Another match play tactic some golfers in Thailand use is to give your opponent a number of three foot putts, then somewhere down the line make him putt out. He’ll be a little surprised and also worried knowing he hasn’t made one for a while. Certain gamesmanship can cross the line, and almost be unethical, but if I’m golfing in Thailand with a close friend who I know well and there isn’t much on the line, I may stand facing him on the tee with my legs crossed in the golfers pose, and just as he is completing his back swing, I will uncross my legs, which catches his eye and more often than not sends the ball into places most golfers have never seen. This is a little too much, but an excellent ploy if there’s no money on the line and someone has tried to upset you via some form of gamesmanship of their own. 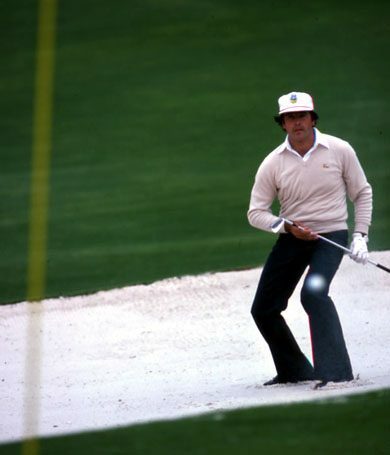 Of course, Lee Trevino was considered one of the masters who often made noises with the Velcro of his glove, and Seve Ballesteros’ sudden coughing fits are legendary. But, you don’t have to be a Seve or Trevino to install a little niggling into even the friendliest of matches. In any case, even if you refrain from such actions, you should be aware of what others maybe doing to get your nerve. Whatever happens, just realize that some guys need to stoop to such lows. Do not let their gamesmanship affect you and you will have a great time golfing in Thailand!